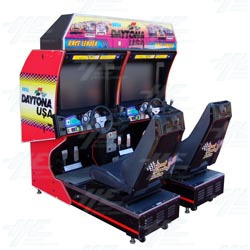 We will shortly receive 12 twin Sega Daytona USA Arcade Machines and offer them for sale fully refurbished and serviced, including 30 days warranty. Daytona USA has been one of the icon games in the amusement industry and still highly regarded as one of the best arcade games ever made. Daytona USA offers 3 tracks, linked play up to 8 players and motorised steering. Machines will be fully reconditioned by experienced technicians and will be offered in plug and play condition. Ideally suitably for your arcade venue, street location or home games room, please discuss with our sales team to reserve your machine. Machines will be available from our Newcastle, NSW warehouse.